If you wanted to make this easier, you could make a quick swap by opting to use one of our delicious Signature Tastes Jams. Beat the butter, honey and vanilla extract in an electric mixer until light and fluffy. Add the flour a bit at a time until it is all incorporated to give a smooth, soft dough. Tip the dough out onto a clean surface, knead into a smooth ball and flatten slightly. Wrap in cling film and refrigerate for 15 minutes. Preheat the oven to 180°C/gas mark 4. Line two large baking trays and one small tray with non-stick baking paper. Roll out the dough between two sheets of parchment paper until it’s about 5mm thick. Use a 7cm round cutter to stamp out 40 rounds, arranging them spaced apart on the two large trays as you go. Use the star cutter to stamp out one star from the centre of 20 of the rounds. Arrange the star cut-outs on the small tray. Bake everything in the oven for 8 to 10 minutes, swapping the trays around halfway through. Once cooked, the shortbreads should be lightly golden and just soft to the touch. Remove and leave to cool for a few minutes on the tray before transferring to a wire rack to cool completely. Meanwhile, put the cranberries, maple syrup, orange zest and juice and cinnamon stick in a saucepan and bring to the boil, then reduce to a simmer for 5 to 6 minutes. As the cranberries begin to soften and pop, crush them lightly with a masher or the back of a spoon. Once it begins to thicken to a jam-like consistency, remove from the heat and remove the cinnamon stick. Blitz in a mini blender until as smooth as possible, then leave aside to cool completely. Blitz the coconut to as fine a powder as possible. A high-speed blender is best for this, but a mini blender will work too. Spoon 1 teaspoon of the jam into the centre of each of the whole cookies. Place the blitzed coconut in a sieve and dust the round cookies with the star cut-outs with it. Place one on top of each jammy round, pressing it down gently. Arrange on a serving plate or tiered cake stand. 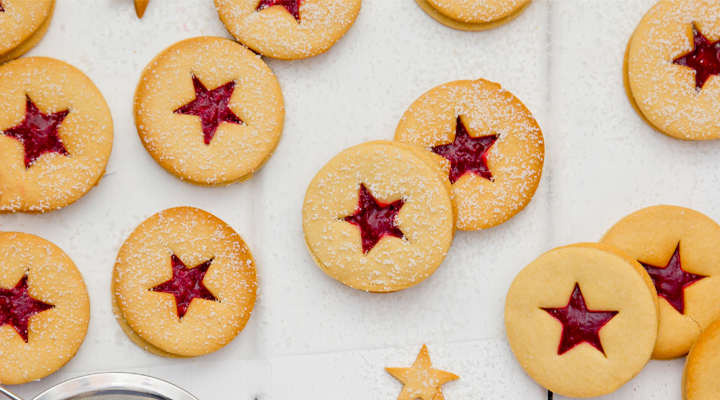 Dust the star shapes with coconut too, then arrange them around the jammy dodgers and serve. These are also ideal to package into a pretty box or jar to give as a gift.